James Paul McCartney was born in Liverpool on June 18th 1942. In 1956, Paul writes his first song, I Lost My Little Girl. For his complete biography, click here. His official website is here. 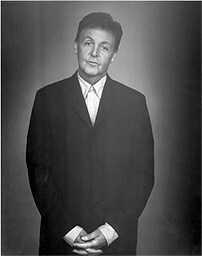 Paul McCartney and TFF's founder Jan Oberg met each other in Liverpool in 2001 through Paul's school friend and TFF Associate, Jonathan Power. This is how Jan remembers his meeting with Paul. This is also where you can read Paul's poem for peace, written exclusively for TFF and see the Beatles record from 1961 that he signed for Christina. Sir Paul accepted to become an Honorary Friend of TFF in 2002 and we made it public at the event of his concerts in Copenhagen and Stockholm in early May 2003. © TFF1997 till today. All rights reserved.